The Art of Science: What’s a Wirbelwerk? I’m crazy about Olafur Eliasson’s Wirbelwerk, an installation of colored glass, metal rods and a light source that throws constantly changing patterns over every surface of the atrium at Munich’s Lenbachhaus. Wirbelwerk, which means vortex or whirlpool, looks like a glittering, light filled cross between a tornado and an icicle. 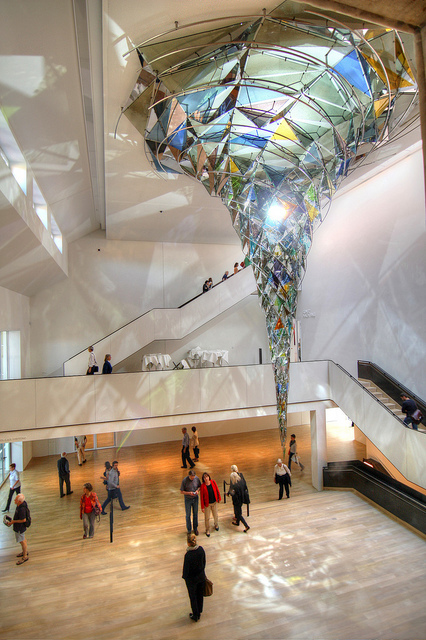 The piece combines three longtime preoccupations of Eliasson’s work: weather, light and space. Not to mention packing in plenty of engineering and optical physics for us nerds. Lots more photos here. This entry was posted in The Art of Science and tagged olafur eliasson, optics art, physics art, science art, wirbelwerk. Bookmark the permalink.